This series is manufactured for heavy duty use with easy of portability for the most demanding jobs. 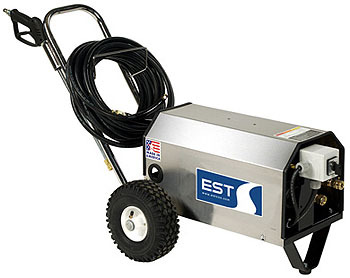 Standard features included 11/4” heavy duty round two-piece tube frame, ball bearing pneumatic wheels, down stream injector, 50 foot hose, shut-off gun, 42” wand and four quick disconnect spray nozzles. All units are standard with external unloader, General triplex put with oil bath ceramic plunger, hose hanger and gun holder. 100% stainless steel available: recommended for HI and Guam. This series combines portability, durability and ample power to handle the most demanding jobs. 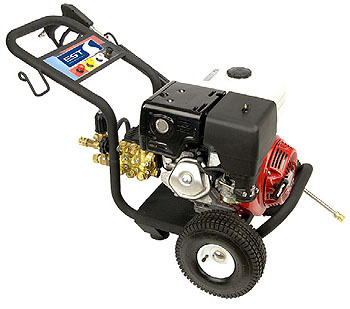 Standard features include powder-coated finish, pneumatic wheels, down-stream detergent injector, shut-off gun, 36” wand, and high pressure hose.Also included, are three high pressure spray nozzles - 0°, 15° and 25° plus one detergent nozzle, and Honda gasoline engine. PC models have internal unloaders. PD models have external unloaders, mag wheels, chrome handles and soap tank on 6.5 HP only. The POWER FORCE BELT SERIES combines portability and durability to handle the most demanding jobs. 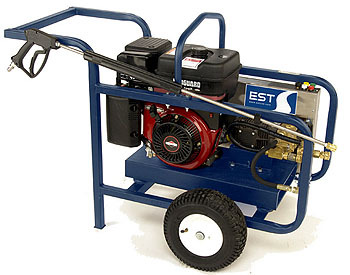 Standard features include belt drive triplex plunger pump, pneumatic wheels, downstream injector (except 5000 PSI models), shut-off gun, 36” wand, and high pressure hose. Also included, are three high pressure spray nozzles - 0°, 15° 40° plus one detergent nozzle, and overhead valve gasoline engine. Most models available in UL. 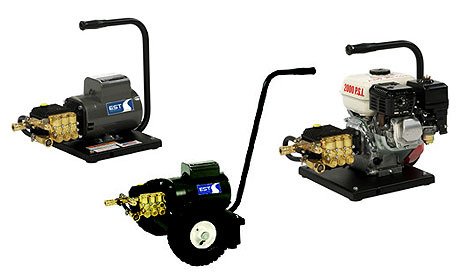 The ELECTRO FORCE SERIES combines portability, durability and the quietness of electric power to handle demanding jobs. These units feature electric motors with low amp draw. 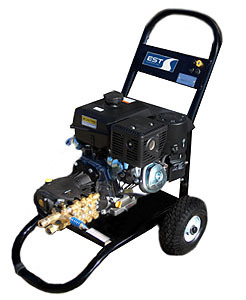 Standard features include belt drive, pneumatic wheels, shut-off gun, 36” wand and 50 ft. of high pressure hose with 3 high pressure nozzles - 0°, 15°, 25° and one soap nozzle, on/off motor control, and downstream detergent. The CC SERIES offers portability and convenience while providing the power and pressure necessary for excellent cleaning. Featuring hand carry frame or wheel frame. Choose either electric motor or gasoline engine. Standard features on all models are triplex plunger pump, detergent injector, shut-off gun, 24” wand and 25 ft. high pressure hose. The SC SERIES offers portable convenience while providing excellent cleaning power. 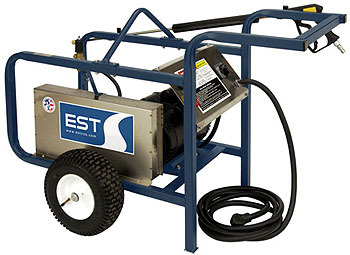 Standard features include stainless steel cover, 1” tubular handle, pneumatic wheels, shut–off gun, 24” wand, 25 ft. high pressure hose, adjustable detergent injector and 160 degree inlet water temperature. Triplex plunger pump standard. 100% stainless steel available: recommended for HI and Guam.